Varied influences lie just beneath the surface of Charley’s work. (Excerpted from a 1998 essay about a show of Charley’s work at the Larry Evans Gallery in San Francisco.) Stylistically, Brown’s eye is eclectic and wide-ranging, too much so to be limited to any single art-historical source. For this reason it is not surprising that Thomas Eakins’ photographs done in the service of a greater, more faithful realism also spring to mind when viewing Brown’s work. The “Male Figure” series in particular recalls Eakins’s time-lapse photograph Pole Vaulter (George Reynolds) of 1884. And, as an overall body of work, Brown’s oeuvre points to the 19th-century scientific photography of Eadweard Muybridge, especially Muybridge’s sequential photographic studies of human and animal locomotion begun, appropriately enough, in Northern California for former state governor Leland Stanford. Additionally, there is lurking within these works the imprint of other artists, most importantly 20th-century British painter Francis Bacon and Caravaggio from the Italian Baroque. 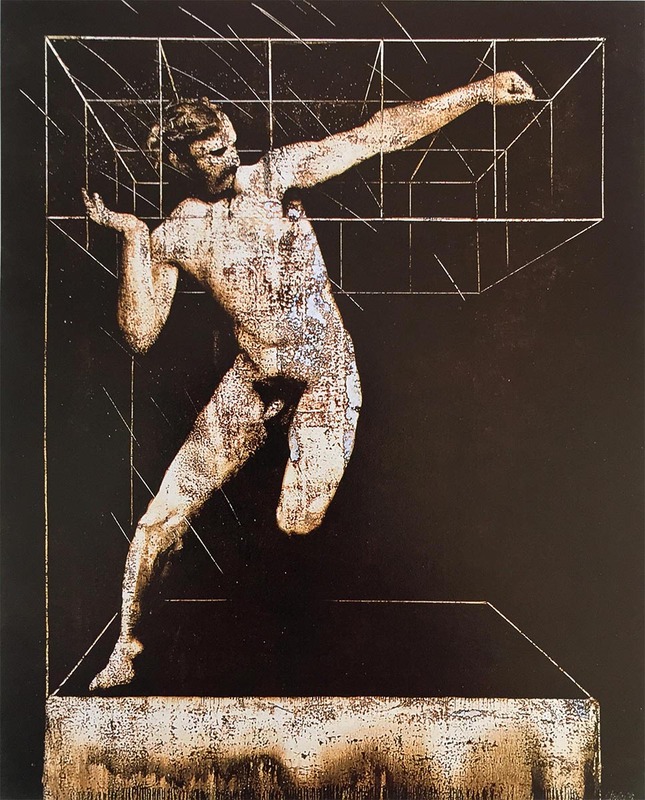 Bacon is most visible in the linear armature that creates an ambitious spatial setting or envelop for many of Brown’s figures while Caravaggio is present in the dramatic chiaroscuro that engulfs Brown’s figures in a shadowy half-light. The urge to employ a variety of different and even seemingly disparate traditions, as Brown is doing here, has become a commonplace of much recent art. In the hands of many less thoughtful artists it betrays a Postmodern attitude in which older art is employed as a sign of its own death and art history is treated as a junkyard of indifferent images to be picked through at will. If Brown was not capable of holding all of these traditions deftly there would be a temptation to see his work as just another example of this. But he is hardly a scavenger, a Post-modern rag-picker indifferent to the aesthetic dimension of art. 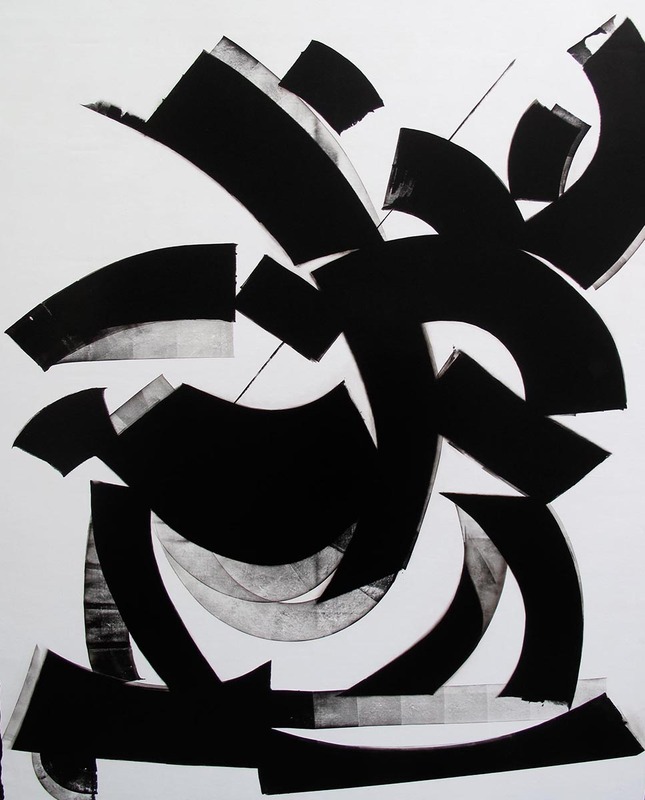 For one thing, unlike many younger artists who today are trained in the ideas of art but not its materials, Brown has a sure and steady command of all aspects of material, technique, and process. His works are too carefully crafted for anyone to not sense a profound belief in the aesthetic object as conveyor of meaning, a meaning that exists beyond the grasp of the spoken or written word. If not a typical Postmodernist appropriator, Brown is also not a late Modernist who strives to collapse all of tradition into an emblematic moment, into a timeless and unending Modernist present. Instead, and this is one of the things that makes these works so interesting and gives them such resonance, rather than lifting images from their art-historical context, Brown constructs new images (and new meaning) by forging older images and historical contexts together. By treating style not as a reproducible, endlessly repeatable device severed from all historical roots, but as a way to cast the light of past traditions onto the present, he infuses his paintings with historical background giving to them a sense of the weight and import of history. On one level this is evident in the way the Baconesque space and Caravaggesque half-light add an unsettling element to his pictures by helping dramatize action while, at the same time, isolating each figure or figural group in arrested motion. 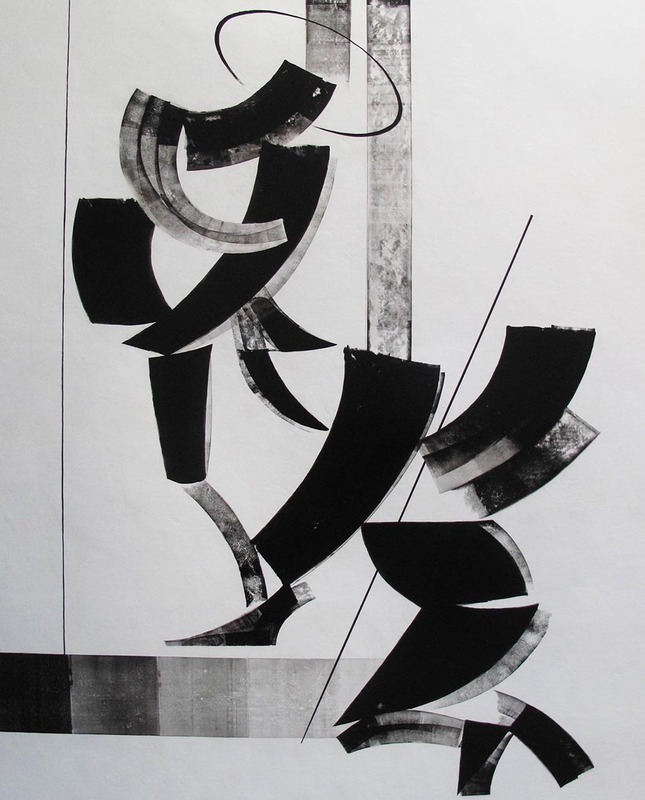 The result is a play against the sense of movement inherent in the time-lapse and sequential photo sources that Brown uses as the basis of his compositions. 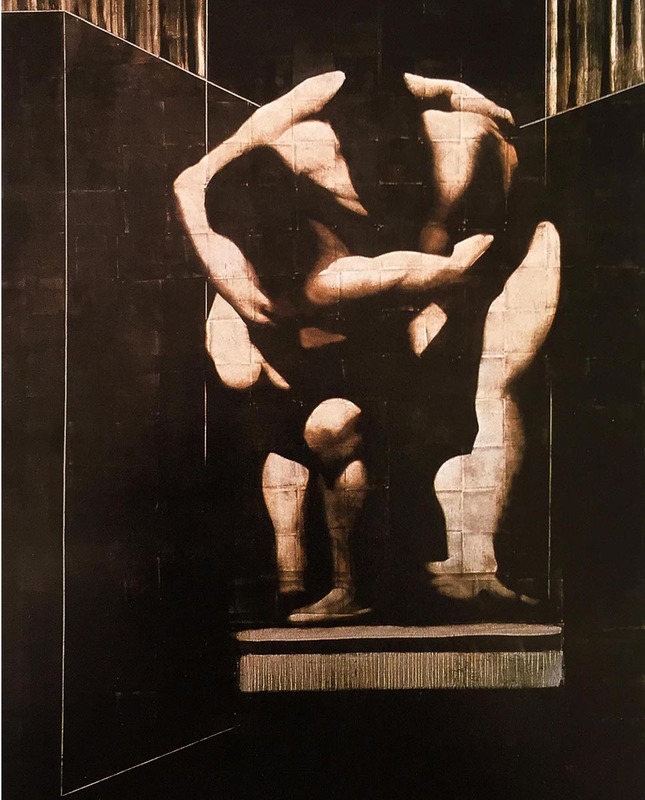 At the same time, his images, created through an additive and subtractive process–painting and rubbing, layering and erasing–achieve an almost photo-emulsive surface quality, a translucent depth that, when enhanced by the sepia-like toning, conveys an almost palpable sense of the passage of time. As these many and varied sources, resting just beneath the surface of Brown’s paintings, echo forth as a latent narrative, they link the past and our historical knowledge of it together to make the present. Thus actions taking place in the present are given the full weight of the past, a past that will inevitably shape the future. It is by placing such moments before us that Charley Brown creates a powerful contemporary narrative, one which makes us aware that we are the latest link in a continuum of consciousness, that we (the self) exist as the latest moment in the drama of life continually unfolding within around us. By Howard Risatti, professor emeritus of contemporary art and critical theory at Virginia Commonwealth University. Used by permissison.